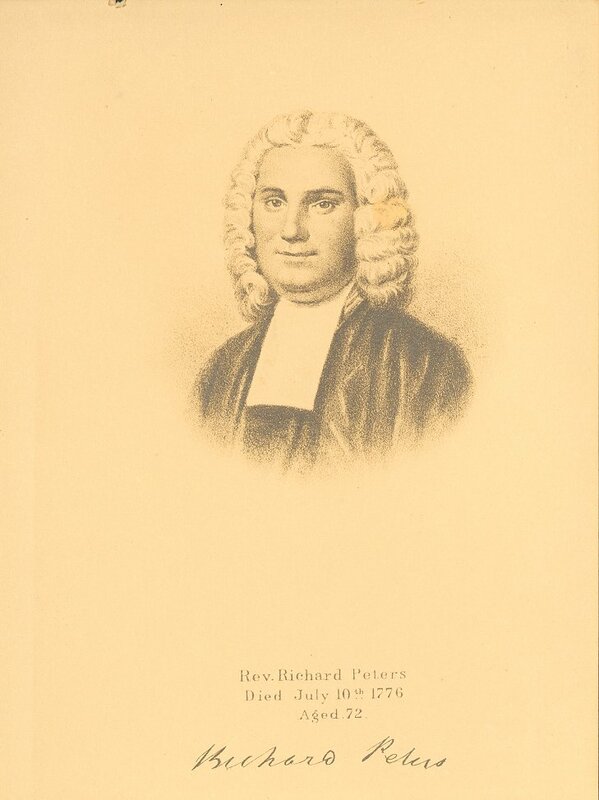 Richard Peters was born in Liverpool, England, in 1704, the son of Ralph Peters, a lawyer and local official. He was well educated, attending Westminster School and the University of Leyden before studying law at the Inner Temple for five years, in accordance with his father’s wishes. Finally, after a short period of study at Oxford, he was ordained a deacon in the Church of England in 1730, and a priest the following year. He came to Philadelphia in 1735, after a scandal developed when it was discovered that his first wife was not dead as had been thought and that his second marriage was not valid. Within two years, after preaching and serving briefly as assistant rector at Christ Church, he became embroiled in a feud with the rector of Christ Church. When the Bishop sided with Rector Archibald Cummings, Peters resigned as assistant rector, although he served as a vestryman at Christ Church in 1740 and 1741 and from 1745 to 1753. Peters soon became a trusted official of the Penn family, appointed in 1743 as Secretary of the Land Office for the proprietary family, Secretary of the Province and Clerk of the Council. He held these positions for a quarter of a century, and in 1749 was also appointed as a Council member. Peters was instrumental in the creation of the defensive union of the colonies, serving as one of Pennsylvania’s commissioners to the Albany Congress of 1754 with the approval of the Penn proprietors. According to Benjamin Franklin’s own account, Peters is said to be the first person Benjamin Franklin consulted about establishing a school in Philadelphia. Peters was one of the founding trustees of the Academy and College of Philadelphia (now the University of Pennsylvania). During the French and Indian War, when Benjamin Franklin headed an anti-proprietary faction, Franklin and Peters had a falling out. Peters and Reverend William Smith worked together to have Peters replace Franklin as the board’s president. Peters served as the president of Penn’s board of trustees from 1756 to 1764 and then, in 1769 and 1770, as its treasurer. Peters was involved with other important Philadelphia civic and cultural institutions. He was a director of the Library Company of Philadelphia (1750-1764), a manager of Pennsylvania Hospital (1751-1752), and a member of the American Philosophical Society (1769-1776). By 1762 he had amassed a respectable fortune and retired from his proprietary offices to his country home at Belmont, just outside the then city of Philadelphia. In this year he was made rector of Christ Church and St. Peter’s, holding this position until 1775. He died at Belmont in 1776, during the early stages of the American Revolution.